Walking through the squatter village and dodging the puddles from the downpours! 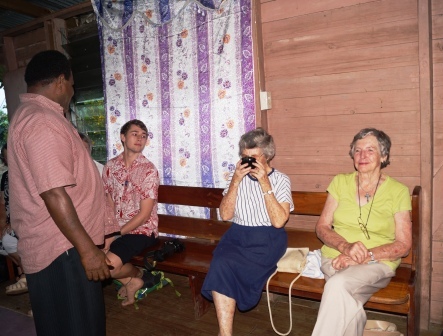 ‘Fiji time’ occurred as we waiting for a planned taxi to ferry our Golden Oldies from the top of a steep gradient down into the depths of a valley where we planned to meet the local church in this squatter village. But the taxi didn’t come, so these courageous people cautiously made their way down this uneven ‘track’ themselves to the welcoming group on the valley floor. ‘Emmanuel’ –God is amongst us, God leaving his ‘home’ to come and live amongst us. This was a reflection that came to our people as they had left their home and made their way down into another culture and remote village people, to share together the love we have for God. 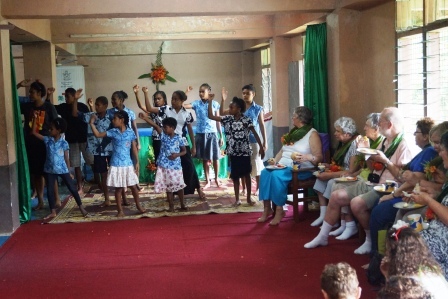 The village comprises of about 200 ‘houses’, half being of indigenous Fijian descent and Methodists; and the rest are of Melanesian descent worshipping at the Anglican church. Both having their churches in this valley and together they share a pre-school. The village people like other villages has a roster to go fishing daily, leaving in their long-boat canoes with outboard motors, navigating through the mangroves to the ocean to fish. Then returning on the incoming tide 8-hours later, they return and others will take the fish to the Suva market, an hour away to sell. Their main source of income for the village. 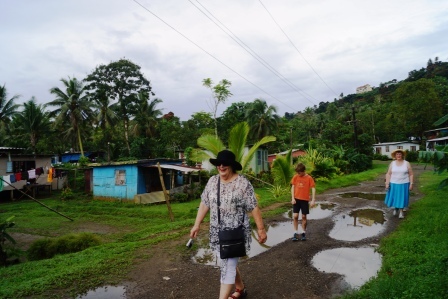 The team met children and families as they walked through the village and then were hosted to a delicious lunch of fruits and coconut milk –which was poured into glasses to make it easy for them to drink. Children everywhere loved joining the team for a photo shot! 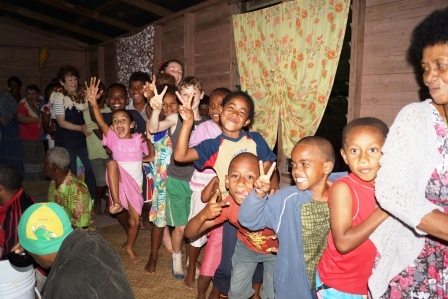 The children sang and danced and the team reciprocated. Time to leave and met the scheduled taxi to ferry our Oldies back up the torturous mountain track. But ‘Fiji time’ occurred again. No taxi met us, too steep they decided for the taxi to come down the hill! Our oldest Golden Oldie being assisted to ‘climb’ the hill! 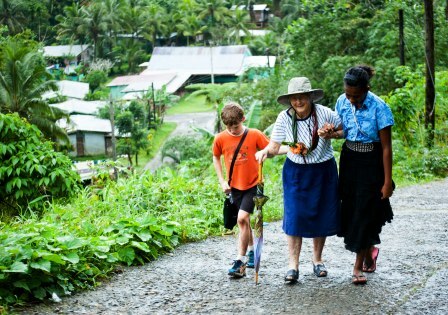 and then suddenly to my absolute astonishment the team ,all with their walking sticks and dodgy hips, with support from the village children started climbing the hill! The God of miracles gave them an inner belief and strength that they could do this. They did. [Today has dawned brilliantly sunny, 26C, and the Golden Oldies are heading to a coastal resort for some well-earned rest. 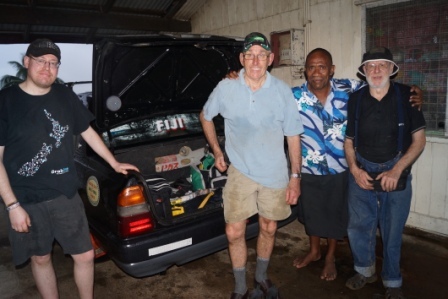 Saturday night they are being hosted by a village for a meal, and Sunday morning they leave early, returning to Suva to join in the first-ever ‘bula’ service at the Anglican Cathedral. And of course the Sunday afternoon is the trip out to the remote Wailoku Valley Village for the grand opening of the dunnies!! and subsequent village celebrations]. The AAW (Association of Anglican Woman) has an outreach counselling centre called the House of Sarah which the team visited. 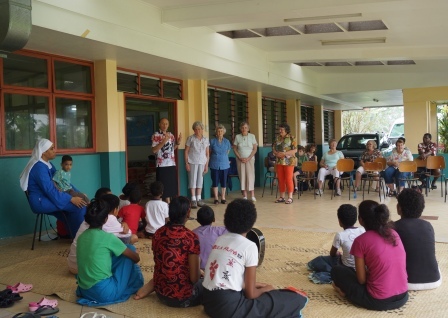 They learned about the sad increase of family and woman abuse that is occurring in the Fijian community, and the education, training and counselling programmes being developed. 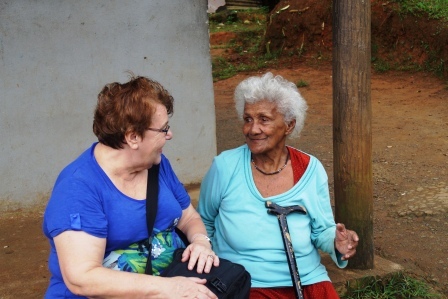 It has also been evident throughout the mission of the role and importance of the AAW groups in all the villages we have visited. They are like the ‘backbone’ of the community and the support received from NZ AAW groups is highly valued and appreciated. Meanwhile the boys, our project team, arrived home late last night, exhausted, but as heroes for the enormity of the work they have done this week with the village toilet project. A guard of honour was formed by the Golden Oldies and they were clapped and applauded by the team as their tired bodies made it to the dining room to collapse. They have done an outstanding job in installing all the pipe work and toilets/basins for what is becoming a massive planned official opening this coming Sunday afternoon. Next week I will post the story and pictures. 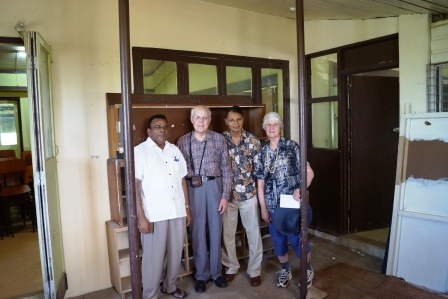 Last year the Golden Oldies visited a church that had a dream to start a theological library. All they had was a derelict storage room and no books. In response, Archer’s Chaplain on that trip, John Ward, and other team members came back to NZ and started collecting theological books. Now this year, 60 books were carried across in our teams suitcases for this church. 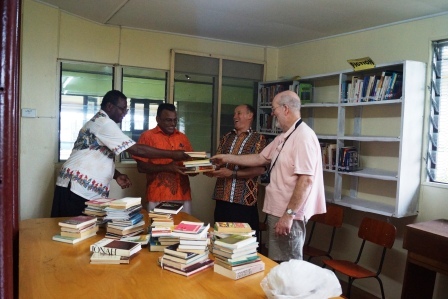 Today, Peter, as the Golden Oldies representative came with us and we handed over these books to the Minister. It was wonderful to see the transformation of this store room into a library, and see books that had already been gifted. 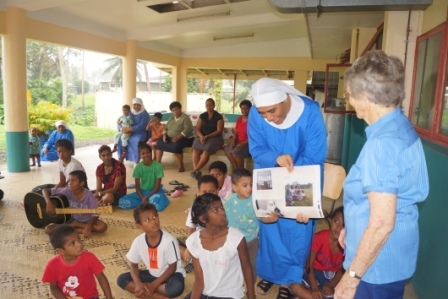 The church ministers predominately to the Fiji Indian community and they were absolutely delighted to receive the Golden Oldies gift of these bible study books. 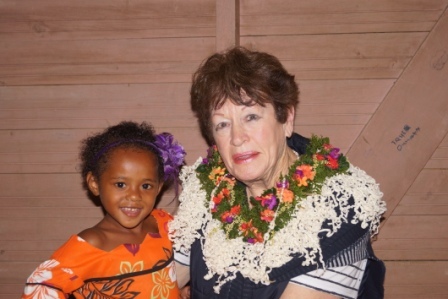 Our oldest Golden Oldie, 84-year old Pauline, visited St Christopher’s orphanage 40-years ago with her daughter. With pictures she had taken then and had placed on posters she brought them today to present to the Sisters. Along with Pauline, our AAW team members who have been long supporters were delighted to be visiting this ministry. was the common cry of all these ladies. Not to be out done, our ‘Junior Golden Oldie’ Andrea, met a 19-year old girl here who is trialling out to see if she can become a fulltime nun. While walking around with her, Andrea asked her what her name was. 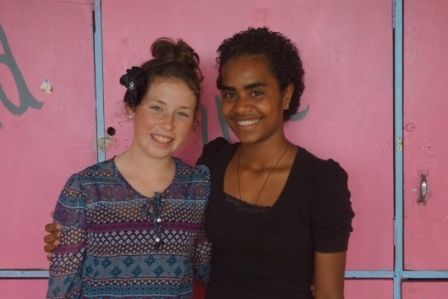 “My Fijian name is Aerita” she said, and in English it is Andrea. Well what a coincidence! Aerita was a lovely host and we’re sure she will do well with her chosen desire. 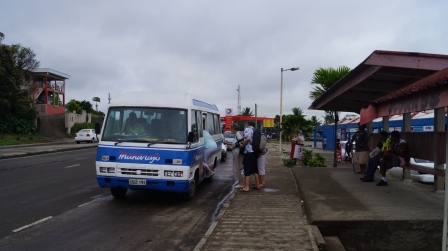 Returning to Suva after being hosted by the people at St Lawrence Church, the oldest Anglican Church in Fiji, we suddenly came to an abrupt stop outside a police outpost. Stepping off the bus we walk around to the front of the bus and see the fan belt broken and in pieces on the ground. Stranded, and still a long way from home, ‘tired oldies’ on board, and repairs hours away, didn’t look good. Sit and wait? A fleet of taxis? 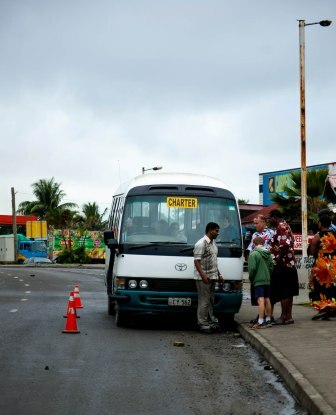 Wait for public transport to Suva central then walk up the hill to the College? “how did that happen?” God is still doing miracles today!! God had a better idea, and shows again, he had gone before us… as around the corner comes a mini bus, and as we discover later, it is driven by our drivers neighbour. He stops and hears the situation. All board he says! And within 5-minutes of breaking down, we are being driven back to the Bible College –at no cost to us!! Our miracle-working God does it again! 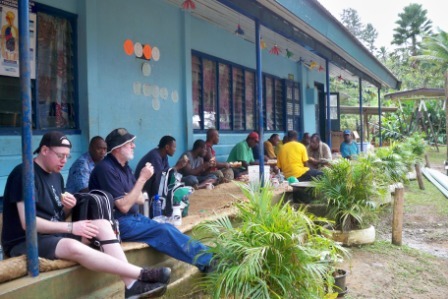 The remote valley school and church where Allan, Grant and Tim have been travelling to each day is the culmination of a partnership starting a year ago. The toilet project involved the village people raising money and starting the toilet building. 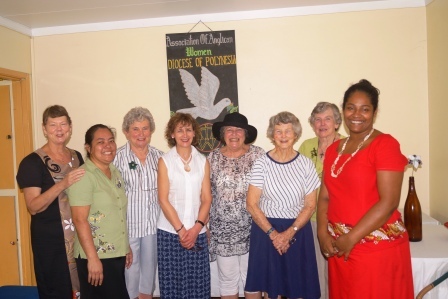 Then the Golden Oldies and NZCMS Families groups contributed funds. 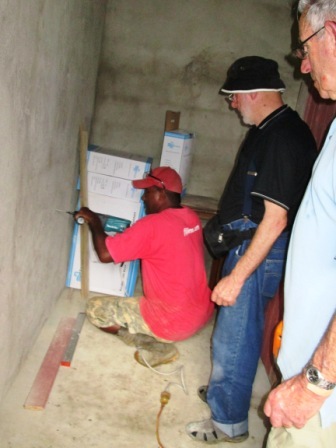 Now ‘the boys’ as part of this year’s ‘Golden Oldies’ team are using their plumbing and joinery skills to teach and work alongside the local men to install the toilets. And true partnership it has been. 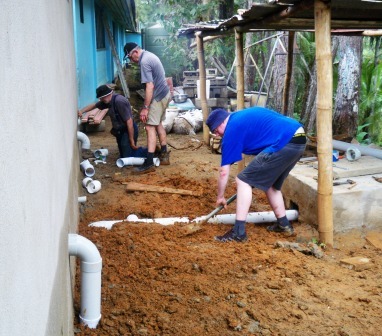 Our boys teaching skills as they install the doors, pipes, toilets basins; and the Fijians show them how to ‘rest’ with Fiji time, especially after lunch with a compulsory rest! 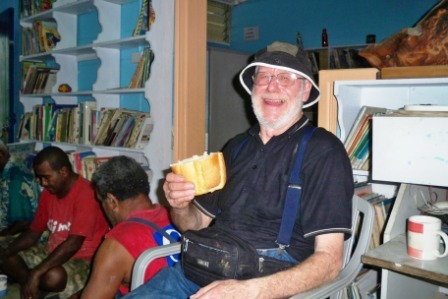 Allan enjoys a Fijian ‘brick’ sandwich, a loaf of bread for afternoon tea!!! Its a race to finish the installation before the entire village turn up on Sunday for the grand opening, and subsequent Fijian festivities to follow, with the Golden Oldies as VIP guests! “its the rain that is hindering us at present” Allan says, but God-willing we will get to the finish line before Sunday! 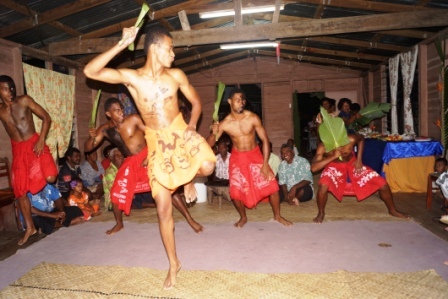 The kava was ‘enjoyed’ by all, or should that be ‘endured’! Hosted by a squatter village high up in the hills, overlooking the Suva harbour visible in the distance was another joyous occasion. The children and village people welcomed us as we walked the trails to their community building for a cultural experience extraordinaire. This Melanesian village is scheduled for a new housing development sometime in the next 5-years, according to the rumours, because of its picturesque views of the sea. Yet it has been the life-long home for these charming people we mingled with. The kava ceremony was actually an honour, the meal of freshly cooked fish and ‘lovu’ (Fijian-hangi) of chickens and meats, along with the fresh fruits, was amazing considering their poverty. Followed by a Fijian dance and dancing involving the whole village concluded another inspiring day. Earlier in the day we had visited the Anglican Schools especially focusing on educating many of the students from the surrounding squatter villages. Being welcomed by the student’s choir of heavenly voices harmonising was heart-warming. ‘Mata’ is sitting at home but he wants to come back to school”, and with that comment the newly appointed Principal Mika, went to find out ‘why’ he wasn’t coming back to school. Visiting him, he discovered his Uncle could not afford the annual high school fees of Fj$230/ NZ$180. Mika recognising the unique role this Anglican school has in supporting students from low socio-economic backgrounds, encouraged the student back to his studies. Living with his uncle who has 10 children of his own meant there wasn’t enough money for furthering his education. He only recently met his Mum for the first time and has never seen his Dad, yet he wants to do well at school. His dream is to become a doctor. 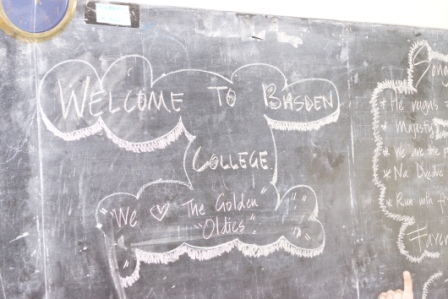 Basten College has struggled to offer a full range of studies, and has a goal to establish a vocational training centre. This is to train in employment-related skills for apprenticeships, tourism, retailing and business. Planning is well underway. We then visited the e-learning centre at the University where specially designed laptops for primary school aged children in developing countries are being trialled. Our team, and especially the teachers of our team, were impressed with how clever these computers were and the impact they will have in lifting the education of students here. Now to get these laptops to these children in these villages. 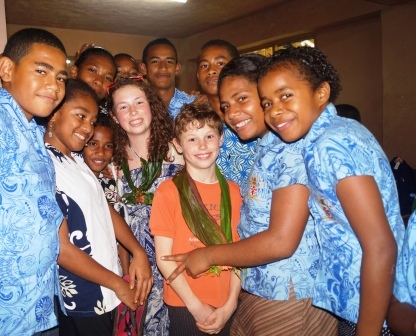 This school and university were further examples of the Fijian faith they have to believe in greater things beyond their human capabilities. Just like the Tin Cathedral faith vision the day before, it is challenging our Golden Oldies in how we should respond to these inspiration education visions.